products by means of a belt, driven by tapered pulleys. turns. Other degrees available. Contact Us. bearings. Adjustable to control belt tension. at center line of conveying surface) 40 lbs. bearings on drive and tail pulley. Re-lube type. equipment. See chart below for available elevations. chart above. Higher speeds available, contact factory. parts ordered independent of a curve.  Motor Drive Chain Guard Location Standard on Outside Radius, May Be on Inside Radius (Specify).  Drive must be located on the discharge end.  Please Provide Sketch With Order.  Items in Black will ship in Two Weeks.  Base Price Does Not Include Supports. Overall Frame Width 16-1/2" 18-1/2" 20-1/2" 22-1/2" 24-1/2" 26-1/2" 28-1/2" 30-1/2" 32-1/2" 34-1/2"
* Refer to the bottom of the page for conveyor weights. supports and bracing for conveyor. For elevations above 54, contact us. Includes Mounting Brackets and Cross Pipes Only. Available (contact us). Paint chip must be provided. 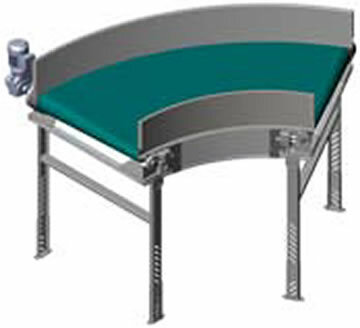 BELT 16-1/2" - 22-1/2" 24-1/2"
BELT 26-1/2" - 42-1/2" 44-1/2"-54-1/2"
Conveying Surface 11"- 19" 21"- 37" 39"- 49"
Belt Width 10"- 18" 20"- 36" 38"- 48"
Overall Frame Width 16-1/2" -24-1/2" 26-1/2"
Inverters for 5 HP motors.